When the new Regent Theatre opened in Rundle Street Adelaide on the night of the 29th of June 1928 it was hailed as “the most glamorous and beautiful picture palace in Australia”. Writing in The Advertiser that day, journalist Valmai Stephens described it as “far more than a mere place of amusement, for there is an air of dignity and nobility and sense of space about it. “There is magnificence here, but nothing garish, and the pictures and statuary are such as might well be secured for the nation. In the lobby downstairs, with its marble pavement, the huge mural paintings of the centaurs give a hint of the charm and beauty of the rest of the place, but they would hardly prepare anyone for the rare beauty of the foyers; Louis Quinze furniture, gilded and elaborate, gives the right touch of opulence”. Over a four page spread in the newspaper, the Regent is described in an advertisement as “Rearing aloft into the skyline, a Temple – dedicated to the People as a lasting tribute of the greatness of the motion picture – youngest, yet most progressive of the arts of the world”. Such was the excitement generated by the opening of the grand new theatre that 5CL, the local ABC radio station at that time, broadcast a live description on the wireless of the theatre and the crowds attending the opening. The following day the paper reported that “Half of Adelaide appeared to be at the opening of the Regent Theatre last night to see and to be seen”. The inaugural program included two full-length feature films, MGM’s Flesh and the Devil and 20th Century Fox’s The Gay Retreat. There was a 16-piece orchestra playing that night as the Wurlitzer organ, purchased for the theatre, wasn’t ready and was installed about three months later. The magnificent auditorium also boasted it was one of the first public buildings in the city to be airconditioned. 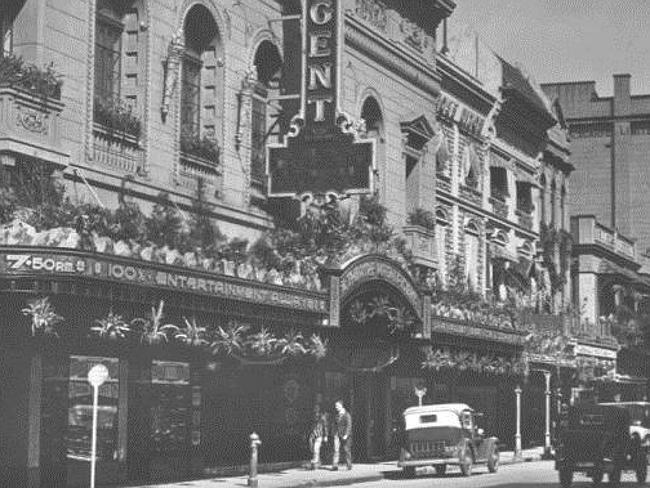 John Cronin, who still works in the film industry as director of Showtime Promotions Pty Ltd, recalls starting work at the Regent in the late ’50s as a 14-year-old young cadet. He remembers it as a magnificent building with over 2000 seats and a massive crystal chandelier, which hung above the lounge circle. “My sister was already an usherette and was able to get me a cadetship which was really just a messenger boy in the beginning,’’ he said. “ I did a stint in the projection room before eventually deciding to pursue management with Hoyts. In the 1950s going out on a Friday or Saturday night to the pictures at the Regent was an occasion. People dressed in formal wear and had permanent bookings, so whether they had seen the film or not, they would be there every Saturday night”. Local movie buff and historian for the Capri Theatre, John Thiele, tells the story of one Adelaide couple who, on hearing the Regent was about to close, actually purchased their permanent seats and took them home to watch TV. “They even had a curtain put in front of their TV so they could sit in their Regent seats and watch the curtain go up before the film started,’’ he said. “When they finally sold their home, I inherited their seats and installed them in my own home theatre. They’re a little bit of the Regent and I don’t think I could ever part with them”. In 1953, at the height of its popularity and fame, the Regent brought CinemaScope to Adelaide audiences with the screening of The Robe but by 1959, with the introduction of television, theatre audiences began to decline. After several years of diminishing crowd numbers the Regent was closed and remodelled by shedding one side of the stalls area which was converted into six new shops facing out into the laneway that ran along the side of the building. An usherette inside the new Regent in 1964. By 1967 however, with figures still falling, plans were drawn up to create a shopping arcade in what was the stalls area, which had the space to produce up to 38 new shops. At the same time the theatre’s famous Wurlitzer organ was removed and given a new home at St Peter’s College, where it is still housed, in the Memorial Hall. The new smaller Regent opened in May 1968 and although it was now just a shadow of its former self, it still incorporated some of the original grandeur of the 1928 facade, the white marble of the grand staircase and parts of the ceiling and side walls of the original dress circle. Seating had been reduced to just 894, all on one raked level. In the late ’90s, with the opening of new and more modern cinemas and multiplexes in the suburban shopping centres, the Regent’s days were numbered and it finally closed its doors for the last time on January 28, 2004. What remains today of the “most glamorous and beautiful picture palace in Australia” is just an abandoned space, stripped of its seats and curtains and used as little more than storage space. There has been speculation from time to time that plans were being developed to open some smaller cinemas in the area that once housed the dress circle of the legendary movie house, but it seems none of those proposals have advanced at this stage. My parents took me to the Regent Theatre for my 10th Birthday, what excitement it was, I felt very grown up. It was a Disney Movie – Cinderella I think, this was in 1949. I loved the Hammond Organ playing on other occasions, sad to see that it has gone. I now live in NSW on the Central Coast at Erina. I love reading about the wonderful past of Adelaide and bringing wonderful memories. Well I got the Organ wrong!! Of course it was the Wurlitzer – I am now 75 – allowed to make a mistake occasionally. Though long after its’ heyday, used to love going to this cinema in the 80s. I worked at a shop in Regent Arcade for a while too. Remember lots of country folks coming down to Adelaide to do their big shop at Harris Scarfes and have lunch in the Sturt Arcade Hotel (where incidentally most of the shop owners and assistants would be having a drink or three most days). Kids could be ‘dumped’ at the movies while Mum & Dad shopped and transported purchases to their vehicle in the Harris Scarfe’s car park. Funny how many memories this story brings back. On one hand, the timing was perfect for a brand new picture palace. 1928 represented just about the last of the old silent films. On the other hand, at the height of the Great Depression,perhaps gilded and elaborate furniture gave a sense of opulence that was badly timed. I am managing the History Carnival for January 2016 and need nominations, for your own blog post or someone else’s, by 31/1/2016. The theme I have chosen for this month is History of the Visual, Performing, Musical and Literary Arts. But I want to reiterate that nominations for any good history posts will be welcomed. We particularly need some southern hemisphere history, by the way. Birks department store was pulled down long before 1968. I worked there in 1962 after I left school.I would have been built around 1961..
My sister worked at Birks in 1962 and on into when it became David Jones. I don’t recall it being pulled down exactly, just redeveloped. Not sure what connection you are making to the Regent, which was further down the street and on the opposite side? My Great grand father,William T Shiers,who was a plasterer by trade,specializing in ornate plaster work,I believe did the art work in plaster that was the surrounds of the stage etc. He also decorated ,with plaster and gold leaf,St.Cecilias chapel in Aloysius college in Wakefield St.
A blast from the past. Love it! Great article about a Beautiful Theatre , but the photo captioned ‘The Regent Theatre in 1968’ is in fact The Regent Theatre Sydney (demolished c 1986) not The Regent Theatre Adelaide! Leave a Reply to Hels Click here to cancel reply.